Our research in drama and theatre studies covers the Early Modern and Restoration periods as well as modern and contemporary writing for the stage. You will find a brief description of our research interests below. Dr Soudabeh Ananisarab's main research interests are in late nineteenth and early twentieth-century English and Irish theatre. She has recently published on the dramatic writings of George Bernard Shaw, John Millington Synge and D. H. Lawrence. Dr Ananisarab is also a theatre historian and has previously worked on collaborative research projects involving performance venues in Nottingham. She is currently preparing a monograph exploring Shaw's relationship with the British regional repertory movement. Dr. Paola Botham’s main research interests are in modern and contemporary political theatre. Recent publications in this area are ‘The Twenty-First Century History Play’ (in Twenty-First Century Drama, Palgrave Macmillan, 2016) and ‘Caryl Churchill’ (in Modern British Playwriting: The 1970s, Methuen Drama, 2012). She has contributed articles to several international journals, including three special issues of Contemporary Theatre Review on ‘David Greig: Dramaturgies of Encounter and Engagement’ (2016), ‘South’ (2012) and ‘Beyond Postmodernism’ (2008). Dr Botham is currently co-editing the second collection of essays from the Political Performances working group at the International Federation for Theatre Research (IFTR) and writing the monograph Political Theatre Reconstructed, to be published by Bloomsbury. Professor David Roberts has published extensively in the fields of 17th- and 18th-century drama and literature. 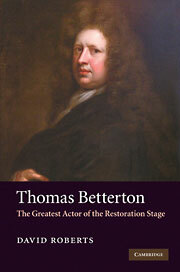 His Oxford University Press editions of Defoe and Chesterfield are widely cited by scholars and his study of the actor Thomas Betterton, published by Cambridge University Press, was shortlisted for the 2011 Theatre Library Association's George Freedley Award. In 2013 he published the first scholarly edition of Thomas Betterton’s library catalogue for the Society for Theatre Research. A further monograph, Restoration Plays and Players, was published by Cambridge University Press in 2014. Professor Roberts' work has appeared in numerous leading journals including Shakespeare Quarterly, The Review of English Studies, and The Times Literary Supplement, and he occasionally writes programme essays for theatres including the Royal Opera House and the Bristol Old Vic.